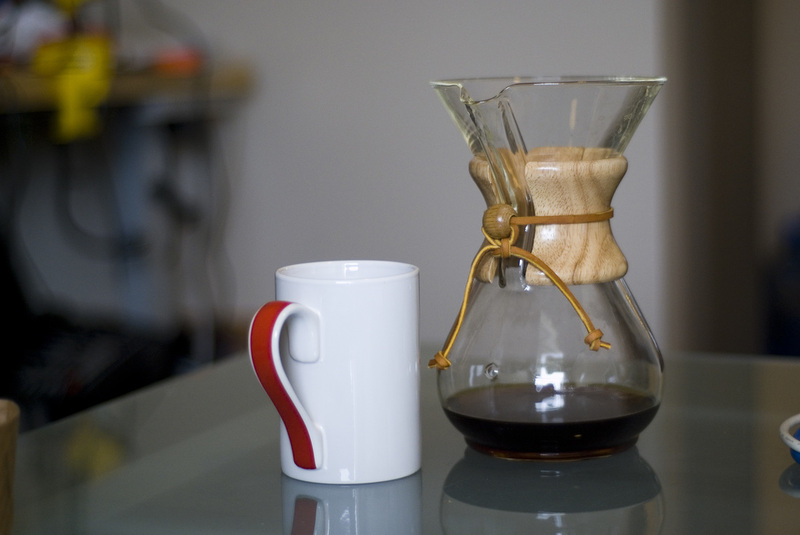 Chemex brewing creates a bright, clean cup. 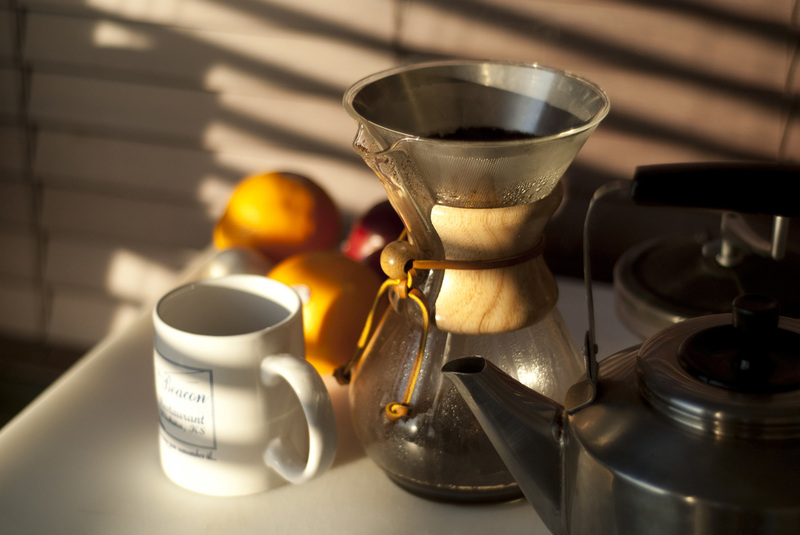 We are particularly fond of this method when we are brewing multiple cups of a coffee that features lively acidity. As is the case with all brew methods, the ratios that we give are general guidelines. All of us have different palates and preferences. So don't be afraid to play around with each coffee until you find the ratio that works best. You will adjust the grind size based on the brew time. When using 60 grams of coffee, we aim for 4min 30sec brew time. If the brew time is less than that, grind finer. If the brew time is longer, grind coarser. Always use a scale for any brew method. We recommend using a scale that can measure in .1 gram increments up to 2Kg. 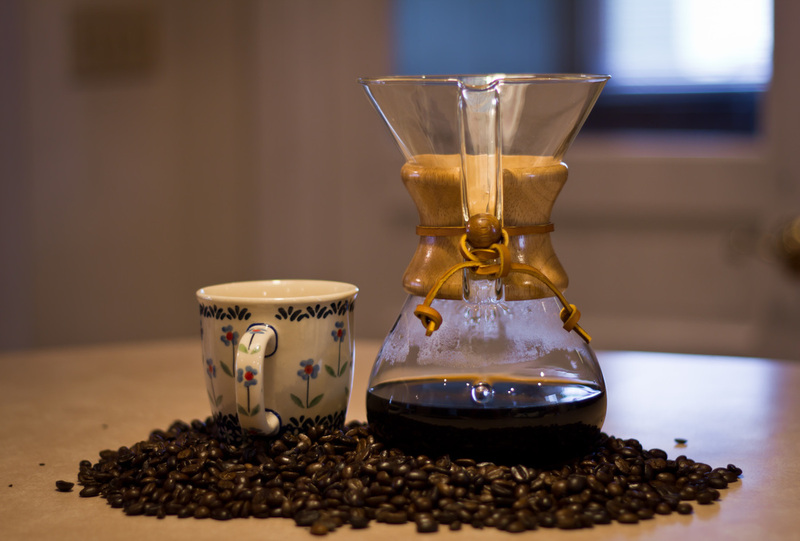 When brewing, place the Chemex on the scale. Heat your water to a boil then saturate the empty filter with the boiling water. This will remove any paper flavor from the filter and preheat your vessel. After one minute pour the water into your coffee cup to preheat. Pour the coffee grinds into the saturated filter and lightly shake to even the bed of grinds. 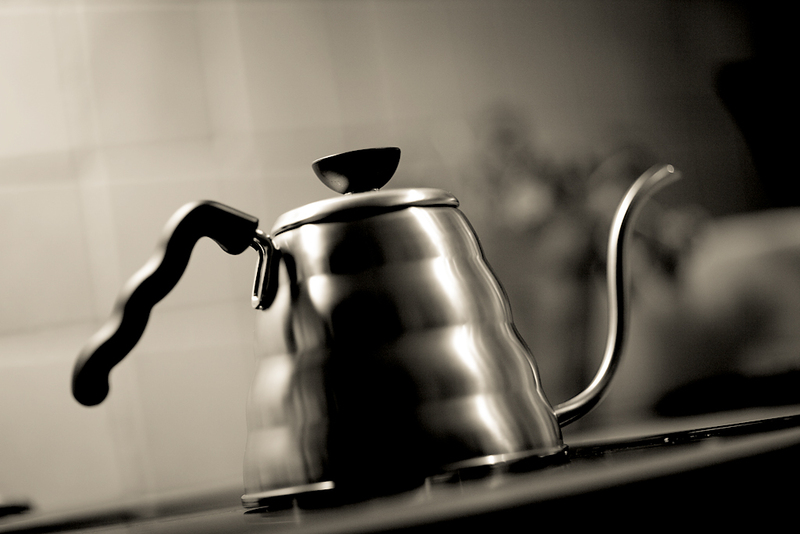 Using a gooseneck kettle and water that is 30 seconds off the boil (the water temperature should be between 200-205 degrees F) pour twice the amount of water that you have coffee for your grounds (e.g. if using 60g of coffee, pour 120g of water). Begin your pour in the middle of the bed of grounds and work your way to the outside using a spiral pattern. Do not allow the water to touch the sides of the filter. Give the coffee 30-45sec to bloom. The coffee will expand as it releases CO2. After blooming has completed, stir the coffee. 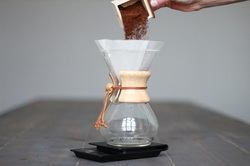 Slowly and using a thin stream, fill the coffee filter with water until it is within a fingertip of the top of the brewer. Add more water as the center of the coffee in the filter begins to collapse. Do not allow the center to sink below the outside of the circle. Stop your pour once you have returned the coffee bed to one fingertip length from the top of the brewer. 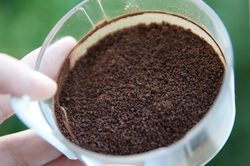 Once you have reached the desired amount of water, remove the filter and grounds. Pour. Sip. Enjoy!